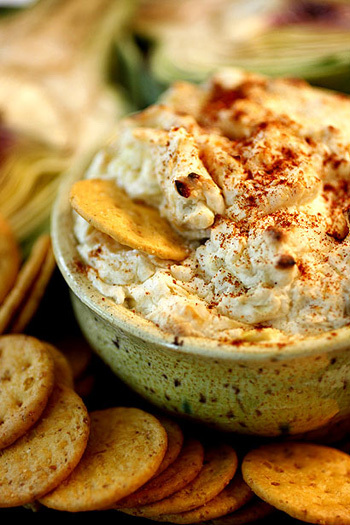 This is my favorite college party dip gone skinny! I bring it to the neighbors for movie night with toasted pita chips. It’s and easy dip for kids to put together and a great for movie night or Super Bowl night snacks. In a large bowl, add the artichokes, Parmesan, yogurt, mayonnaise, garlic, paprika, and black pepper. Transfer to a 8-inch round or square baking dish. Bake uncovered until hot and slightly brown around the edges, 25 to 30 minutes. Serve with raw veggies or toasted pita. Nutritional Stats Per Serving (1/2 cup dip with 8 pita chips): 137 calories, 4 g protein, 13g carbohydrates, 8g fat (0.8 g saturated), 7 mg cholesterol, 2g fiber, 424 mg sodium.